Extreme homesickness, termed “nostalgia” during the Civil War, often killed more soldiers than enemy bullets. 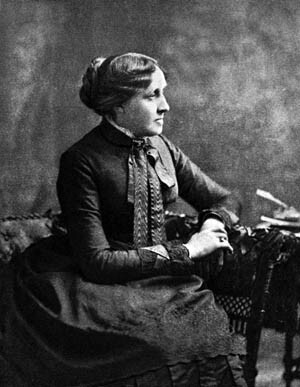 A slight knee wound brought the New Jersey boy to a Washington military hospital, but “his mind had suffered more than his body,” wrote volunteer nurse Louisa May Alcott. “He lay cheering his comrades on, hurrying them back, then counting them as they fell around him, often clutching my arm, to drag me from the vicinity of a bursting shell, or covering up his head to screen himself from a shower of shot; while an incessant stream of defiant shouts, whispered warnings, and broken laments poured from his lips.” Such hallucinations and flashbacks are consistent with what is now called post-traumatic stress disorder. 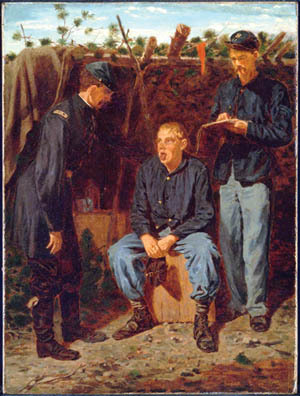 A young soldier feigns illness to avoid combat duty in Winslow Homer’s painting, Playing Old Soldier. Nostalgia was a real issue during the war. 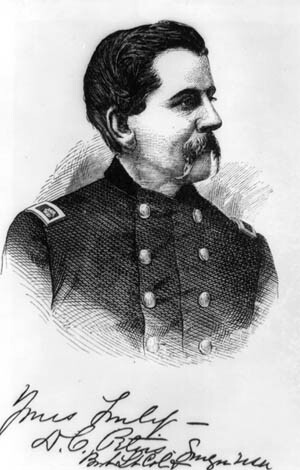 Union Surgeon General William A. Hammond. 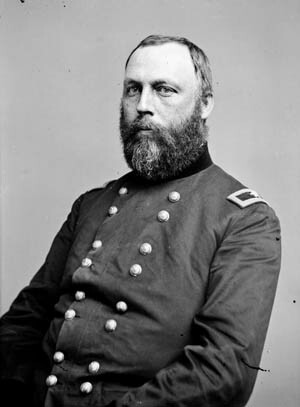 Similarly, Surgeon John L. Taylor noted that “kind and sympathizing words—amusements—seemed to invite a more deplorable condition.” That approach predominated in his regiment, whose officers told soldiers that their disease was merely moral turpitude, looked upon with contempt, and that “soldiers of courage, patriotism and sense should be superior to the influences that brought about their condition.” Taylor claimed better success with his method. “This course incited resentment, passions were aroused, a new life was instilled and the patients rapidly recovered,” he said. 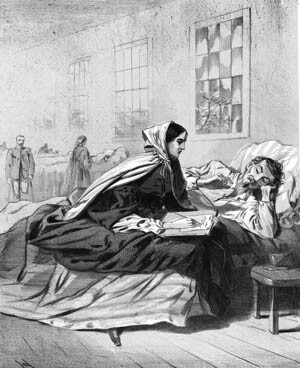 A nurse helps a wounded soldier in the Army of the Potomac write a letter home. Homesickness was epidemic during the war. Another surgeon’s view was to give the troops something to do to pass the dull hours. “An officer should be detailed as Superintendent of Public Amusements, who should be manager of theatrical performances, races, competitive shooting and prize competitions of all sorts.” Ultimately, such treatments may say more about the surgeon than about the patient or disease. Some surgeons noted heart-related symptoms in nostalgia patients early in the war. 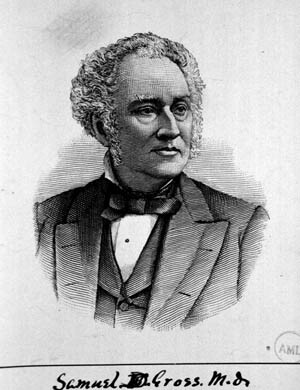 In 1862, Surgeon A.J. McKelway reported heart disease caused by “overexertion preceding the battle and excitement and effort during its continuance.” With the benefit of two decades of hindsight, the surgeon general’s history observed: “Overaction of the heart during an engagement was due perhaps as much to nervous excitement and anticipation of danger as to overexertion. Even soldiers accustomed to the alarms of battle were not at all times exempt from the results of mental impressions.” Many cases arrived in hospitals after the continued exertion, anxieties, and excitement. Some patients experienced acute chest pain even while asleep. Dr. Samuel D. Gross, a prominent Northern professor of surgery. In early 1863, Dr. Alfred Stillé, who worked at a large military hospital in Philadelphia, reported heart palpitations to be a common disease among the soldiers, in a form he had very rarely observed in civil practice. Stille associated it with “a state of extreme exhaustion, especially when occurring after violent and prolonged muscular efforts.” A few months later, Dr. Henry Hartshorne noted among his patients, similar palpitations, which he evocatively called “trotting heart” or “cardiac muscular exhaustion.” Hartshorne recognized nervousness as a source of palpitations but found the soldiers’ palpitations to differ in character from “ordinary sympathetic or nervous palpitation” in his civilian patients. Assistant Surgeon De Witt C. Peters. Da Costa attributed a plurality, some 38.5 percent, of the cases to hard field service, particularly excessive marching. Within this category he included constant and heavy duty on the picket line, active movements in the face of an enemy, forced marches, and arduous and exciting fighting and marching. It was entirely opposite from other physicians’ positive interpretation of battle-related activities during the war. In contrast to an overall lack of treatment for mental disease, there were some treatments in place for heart disease. Da Costa first prescribed rest but also employed plant-based remedies, including digitalis, aconite, veratrum viride, gelsemium, hyoscyamus (henbane), belladonna and atropine, conium (hemlock), and Cannabis indica. Massive numbers of casualties made effective or even humane treatment difficult. Julia Wheelock worked in Washington-area hospitals from 1862 through 1865. She estimated that there were 10,000 wounded in Fredericksburg, Virginia, at one time. All the public buildings, including the courthouse, churches, hotels, warehouses, factories, paper mill, theater, school buildings, stores, stables, and private residences were converted into shelters for the wounded, until Fredericksburg was one vast hospital. This hand-colored photograph of wounded Union soldiers during the Peninsula Campaign shows the makeshift nature of medical help. There was little time to deal with soldiers suffering from complex mental or emotional ailments. Wheelock recounted wounded soldiers begging for pillows. “I’m wounded in the head, and my knapsack is so hard,” said one. Another wanted one for his stump. “I don’t think it would be so painful if I only had a pillow, or cushion, or something to keep it from the hard floor,” the soldier said. One “wretched hospital,” a former grocery store, had only a single small candle for light. When someone moved the candle to another part of the crowded room, Wheelock, afraid she would stumble over the injured, crept on her hands and knees to deliver cups of broth to the wounded, starving soldiers. Many were so fresh from the battlefield that their wounds were still undressed. Given such conditions, it was small wonder that the often overwhelmed military medical establishment could not care adequately for victims with poorly understood psychological needs. After the Civil War, Congress liberalized the law governing admissions to the hospital. Those accepted included former patients who relapsed within three years of their discharge from the hospital, those discharged from the military for insanity, and “indigent insane persons, who have become insane within three years after discharge from such service from causes which arose and were produced by said service.” Giving veterans three years after discharge to seek treatment was a relatively forward-looking admission that mental and emotional wounds, like physical wounds, could take years to heal. A Union doctor from the 14th Indiana Volunteers tends to Confederate wounded after the Battle of Antietam in September 1862. Blankets stretched over fence railings were the only protection from the elements at this crude medical aid shelter. Some wounds never healed. A 2006 study of military and Pension Board medical records of 17,700 Civil War veterans found an association between the men’s wartime experiences and the occurrence of cardiac, gastrointestinal, and nervous diseases throughout the remainder of their lives. One measure found a 51 percent increase in those three disease categories. Those removed from the battlefield were marked by their experiences as well. 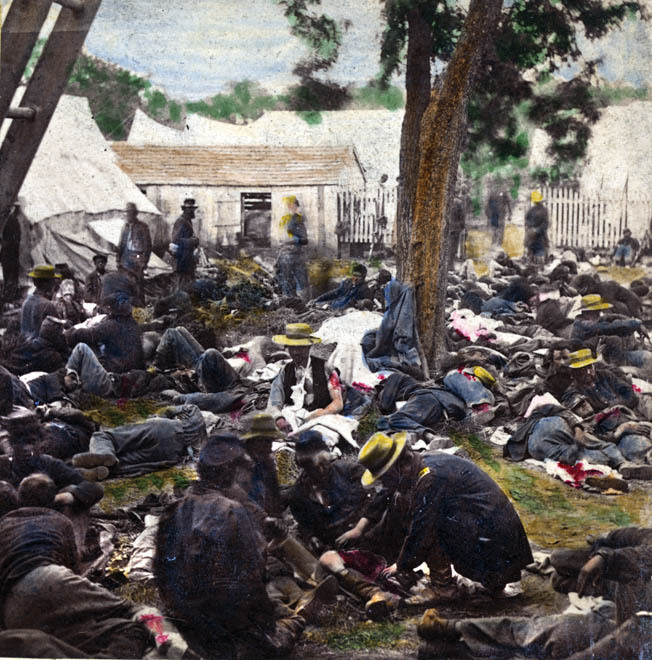 A civilian relief worker wrote that after the Battles of the Wilderness and Spotsylvania, “The surgeons were at work, probing, extracting balls, amputating in the open air, while upon every hand were cries of agony from the poor fellows, which would have melted any but a heart of stone.” Years later, nurse Lois Dunbar recalled, “I have had men die clutching my dress till it was almost impossible to loose their hold.” Even experienced doctors and nurses could not easily forget such sights and sounds. One soldier summed up the literal deadliness of nostalgia: “Would you believe—and yet it is true—that many a poor fellow in the Army of the Cumberland has literally died to go home; died of the terrible, unsatisfied longing, home-sickness?” Against the ravages of nostalgia, he wrote, paraphrasing Shakespeare’s Macbeth, “the surgeon combats in vain, for, ‘who can minister to a mind diseased?’” Sadly, the answer to Macbeth’s rhetorical question remained largely true 2½ centuries later, during the Civil War. “Therein the patient must minister to himself.” For many soldiers, as for the guilt-stricken Macbeth, there was no cure at all. Tags Army of Northern Virginia, Army of the Cumberland, Army of the Potomac, Battle of Antietam, Chancellorsville, Confederacy, Fredericksburg, Jefferson Davis, Peninsula Campaign, PTSD, Sanitary Commission, Union Army.